I looked through my copy of Jamie's Italy last week in search of dinner ideas. I’ve cooked from it a few times before. All of the risottos are tempting, the pasta dishes make me hungry every time I look at them, and then there are a few really simple dishes that just combine a few ingredients. For instance, there’s a sticky fig dessert that just involves slowly baking fresh figs for a couple of hours and serving them with honey and pecorino. Obviously, I got caught up in the dessert chapter wondering why I hadn’t tried anything from it yet and then finally remembered I had opened the book in search of dinners. 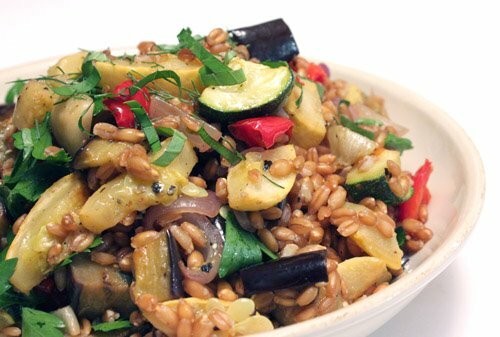 This farro salad seemed like a good choice for July as it brings together all the usual suspects of summer’s vegetable bin. Summer squash, zucchini, fennel, onion, bell pepper, eggplant, and garlic were all chopped and roasted. Then, they were simply tossed with cooked farro, lots of fresh herbs like basil, flat leaf parsley, and fennel fronds, and lemon juice and olive oil. I like the way Jamie writes a recipe. The quantity for the herbs is “a good bunch,” and when the roasted vegetables are removed from the oven, you’re instructed to “sprinkle a little vinegar over” them. That works for me considering that I rarely measure out ingredients for a dish like this anyway. The colorful vegetables give the salad a summery look, and the fresh herbs and lemon wake up all the combined flavors. I was already a fan of farro and its nutty taste and the hearty feel of it. So, I was delighted with the result here. This makes a very big bowl of salad, and I cut the quantities (that were provided) in half. It’s the kind of salad that can sit at room temperature while the rest of a meal is prepared, and it’s the kind of salad you can pull out of the refrigerator and enjoy as a meal by itself, cold the next day. I found a couple of other dishes in the book to try this week too, so those will appear here soon. Oh my, this is such a beautiful dish. I love Jamie. I should get one of his cookbooks. Hi Lisa, I just wanted to let you know that passing on the One Lovely Blog award to you. Your blog really is lovely and I really enjoy reading it! I love farro! It is so delicate tasting and healthy! Your salad looks amazing! I just felt and heard my stomach grumble when I say the first picture. Literally!!! I ain't kidding!!! I love the color and flavor combination in this dish! The pix are a feast for the eyes. btw, the header is good. esp. that cupcake hiding in between the books...the title "lisa is cooking" looks chic too! I have been loving farro and freekeh in salads lately. I buy it precooked vacuum packed at Trader Joe's, and it makes life so much easier. looks refreshing and the colors are so lovely. i have not cooked with farro, yet. you have inspired me. and i love ANYTHING jamie oliver! Lovely salad for summer. Very colorful and appetizing. I love summer roasted veggies and garlic and lots of fresh flat leaf parsley. I hear the rain outside (was sunny when I was out earlier) so summer veg in roasting in the oven might be just the thing to cheer me up! I'm on the fence about Jamie, but I do think that his recipes are great - he keep the integrity of a vegetable when he cooks it. your salad has a really nice combination of veges and colors! i'm a fan of JO too. This is indeed a yummie & typical lovely recipe from Jamie Oliver!! A lovely & balanced meal, Lisa! I nearly have all of his books! He learned me how to make fresh pasta & how to use my pasta machine!! Lisa, I love the new look you have going on here. Very cool. 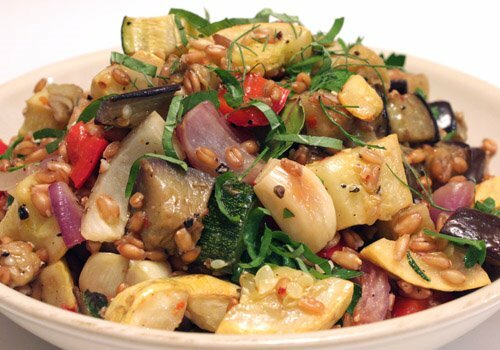 I also love farro - it's totally a grain that can stand up to these veggies. That looks so wonderful and summery. I haven't used that book in a long time - must dust it off! do you ever make anything that’s not absolutely breathtaking? how lovely this is, and what a coincidence that it contains most if not all of my favorite summer veggies. bravo! That looks like a beautiful salad, and so healthy. Just had farro this past weekend for the first time, and it was great. Really delicious, nutty and light. Perfect thing we'd like to recreate one day. oh thank you for this! I always am so interested in new grains, but get so confused as to how to cook it! What a gorgeous salad! It's chock full of delicious vegetables and I bet the leftovers are just wonderful! I noticed your new header last time - I love the food peeking out from between the cookbooks! this is such a summer harvest salad! I love farro. That lemon and fresh herbs really does the trick. It's really good in a leafy arugula salad with a sherry citrus vinegarette - which I had recently. I love the bit on these things. This looks really good. The only problem with dishes like this one is that sometime my eggplant pieces come out a little chewy. This looks really amazing. I want to gobble it up right now and then I want seconds please. 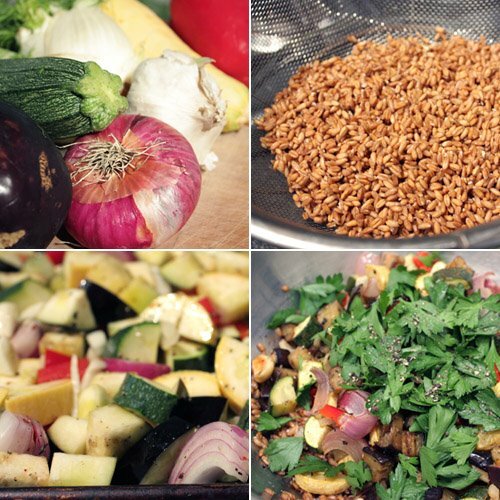 I'm always looking for ways to incorporate hearty, healthy ingredients like farro into my dishes. Thanks for another idea! Jamie's italy is my survival cookbook while I was in Tuscany, it's just great!!!!!!!! I learnt so much and the best was I could buy the ingredients locally and really get to know more about Tuscan cooking. I bought a pack of Farro back, as not sure if I can find them easily here. Will try out this dish soon. Yours look wonderful. What a lovely summer salad, I love all the veggies in it - yum! It looks wonderful! Great combination of healthy ingredients and deliciousness! This is a lovely dish Lisa! I too love Jamie's Italy and have cooked from it many times before but I hadn't tried this recipe yet. I loved the spaghetti tetrazine, maybe something for you to try! I will mark this recipe in the book for next time! A risotto is really the best meal! I love colourful dishes, they look so appetising! Such great flavors and textures going on here. I have a bag of farro in my pantry in Chicago which has remained unopened since I bought it almost a year ago. I vow to do something about that. this looks so tasty. I've never tried farro, I think. wow I just love the variety on this creation of yours, so interesting and so many to pick and eat! I adore farro, but I never think to make it. This would be a great picnic dish. I love how Jamie writes his recipe proportions, too. It's breezy and fun, plus it takes the intimidation out of everything. This sounds like a filling, healthy summer meal! I've bookmarked to try! I've only ever had farro served in a restaurant but would love to cook with it myself, especially after seeing this salad! This is also the second reference to Jamie's Italy that I've read within the past few minutes. I think it's a sign for me to check it out!